The guns, welcome to the gun show, look at those cannons. Yup, the Biceps get a lot of attention and in some people's eyes are the pinnacle sign of being in shape and strong. True, a well-defined arm is nice to look at on both men and women. Fact is, a well constructed arm also embodies the triceps, shoulders, forearms and, of course, being lean enough to see the definition. The point is Biceps training alone is not enough to achieve a detailed, lean, cut, toned (or whatever else you want to call it), arm. Pullups and Rows are just as important. 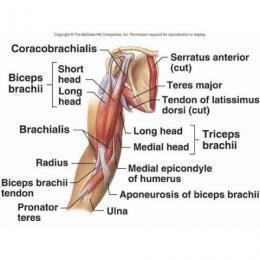 The two main muscles in the front of the arm that epitomize the term 'Biceps' are the Biceps Brachi, the long head going all the way up to and becoming part of the shoulder socket, the short head inserting into the caracoid process on the front of the shoulder blade. The other, Brachialis, lies under the the Biceps and although not as noticeable, provides substance and mass to the arm, essentially filling and pushing the Biceps Brachi outward. Two other (smaller) muscles the Carachobrachialis (deep and underneath) and the Brachioradialis (across the forearm) also contribute to flexing the elbow. Although flexing the elbow in isolation (arm curl) is the popular and most effective way to train the Biceps in relative isolation, it is important to consider their assistive role and contribution to exercises like Pullups, Pulldowns, and Rows. Depending on the plane, angle, body position, range, resistance modality, and your intention, Biceps contribution can be enhanced or diminished. Almost everyone on the planet knows how to do a curl, but most end up choosing too much resistance and perform some kind of twisting contortion move by swinging, swaying, and pulling with everything but the elbow. 'Strict Form' and 'Isolation' are words that I try to avoid, but Form, as it's commonly known, is defined as the best possible alignment, position, and stabilization to emphasize the muscle(s) you are attempting to train with the exercise you've chosen. If you are trying to emphasize and train the biceps, which is a single joint exercise, stabilization, by keeping the shoulder in position and acting as a stabilizer, is vital. The elbow joint is the only thing that should be moving. Options are endless, but here are a few. As with training any body part, the type and direction of resistance as well as bodily position, should be varied. I consider the same joint movement and decide which modality to use. 4 types: Dumbbell, Barbell, Rubber Tubing, Cable. From there, options such as choosing whether to stand, sit, perform together, alternate, come into play. Although there are machines designed to target Biceps, most are uncomfortable and rarely adjust enough to fit the user. Watch the video for the variations. From a standing position, you have the option of dumbbells together, various forms of alternating, or even a 'hammer' grip where the palms face inward emphasizing more Brachioradialis. From there, the same can be performed seated, back supported or not. - Slightly reclining a bench, to say 10 or 15 degrees, can put more emphasis on the long head. - Placing the shoulder in a flexed position, (elbows up and in front of the shoulders), is called a 'preacher' curl. It puts emphasis on the short head. A great exercise to be done with a cable system. Dumbbells are not the best option due to the resistance decreasing going upward and where some benches make the resistance become assistance at the top of the range. Barbells can be used, but of consideration is wrist position. The wrist has a natural angulation of 23 degrees which is not accommodated using a straight bar, thus putting undue stress on the elbows and shoulders. The 'squiggly', or commonly know as a cambered bar, is a better option. Cables are a fantastic option to vary tension throughout the range. Standing and seated, cambered bar, straps, preacher, creative possibilities are endless. Rubberized resistance or tubing, is one of my favorite options. Anchored from behind, under the feet, anchored from the front, they mimicked a cable yet are a completely different for of resistance. If you're not familiar with training with tubing I suggest trying it out with some of your exercises. The first obvious difference is that it's not gravity based, so it plays into your variation of exercises. Second, its resistance profile is unique affording different and effective challenge to the nervous system and muscle. I am convinced that tubing should play a part in every single workout. It may appear that tension always increases as a tube is lengthened but this is dependent on its application to the lever being challenged, or torque. A 50# suitcase held down at arms length is pretty manageable, whereas out to the side is virtually impossible. Same weight...different torque. Tubing makes it easy to change which direction the resistance is coming from and manipulate the amount you are experiencing. An effective torque manipulator!